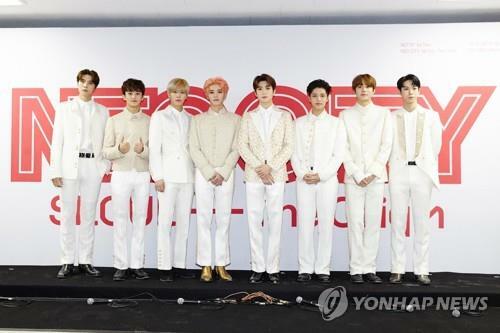 K-pop boy band NCT 127 will visit 11 North American cities in April as part of its ongoing first-ever world tour, the group’s agency said Wednesday. The North American leg of NCT 127′s world tour, “NCT 127 World Tour ‘Neo City – The Origin,’” will kick off at Prudential Center in New Jersey on April 24 and then move to 10 other cities, according to SM Entertainment. The itinerary includes Atlanta, Dallas, Miami, Chicago, Los Angeles and two Canadian cities, Vancouver and Toronto, it said. This marks the largest North American tour for any K-pop boy groups in terms of the number of cities involved, according to the agency. “The tour will allow NCT 127 to stage the band’s uniquely stylish music and powerful performance on top of sophisticated and futuristic stage arts, opening up a new era of concert,” according to SM. On the concert trail, the band will also engage in promotional activities to better advertise the band in the region. “Neo City – The Origin” kicked off in Seoul in January and the band is currently staging the concert in seven Japanese tours. The Japanese leg of the concert wraps up on March 31. NCT 127 is expected to announce European and Asian legs of the world tour.